Enjoy the rare beauty of hand-blown glass dinnerware and serving accessories by Simon Pearce at competitive prices from Distinctive Decor. Pearce brought the experiences and knowledge obtained at the hands of Europe's famed glass blowers to the United States, and he has spent the past 40 years instructing a new generation of blown-glass artisans at his workshop in Vermont. Every American-handcrafted piece is slightly unique because it is handmade, making every Simon Pearce creation highly collectible. 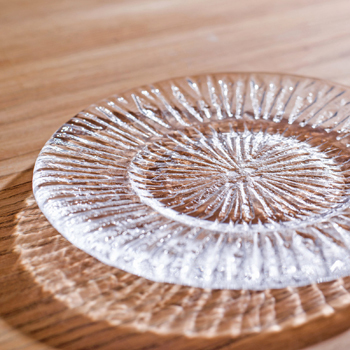 We have Simon Pearce cake stands, platters, elegant hand-blown glass napkin rings and keepsake optic-design hand- and mouth-blown platters that would create a beautiful addition to any room in your home. Shop Simon Pearce-designed mugs, stemware and dinner, dessert and salad plates. Simon Pearce's American artisans have also created handsome copper flatware and service utensils. Also shop our festive collection of holiday glassware by Simon Pearce. We offer a money-back guarantee on every purchase at Distinctive-Decor.com and free shipping on qualifying orders.